You got to love how they associate acidity levels with the aging process itself by showing a young boy morphing into an old man. If only you hadn’t consumed so many acidic Diet Cokes you could still be five-years-old today! 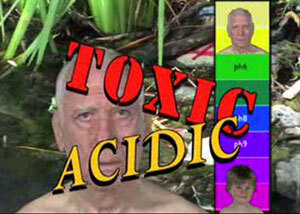 In case you still didn’t get the message that “acid = old = bad” they slap the words “Toxic” and “Acidic” over the geezer’s face. Hey, what did that guy ever do to them! They then cut to a woman bubbling up from a fountain in the middle of a lake, clothed a spotless white dress and hoisting the IonPod, not unlike Lady Liberty holding her torch aloft. …of course their IonPods are filled with Captain Morgan, but the replaceable mineral cartridge will ensure their alcohol has an improved alkaline balance for better health. We also get to enjoy a glimpse into the home life of a man sitting at his breakfast table who takes the IonPod from his wife with trepidation, as if he fears he is about to be poisoned. Once he has finished taking his hesitant sip, he nods in approval, pleasantly surprised that the IonPod did not cause him to immediately begin vomiting up blood. 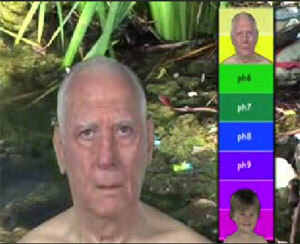 Those teens are actually the “acidic” old man, his wife, and old army buddy after using IonPod for a week. That’s why they are making a toast! does it cure cancer and leprosy also.